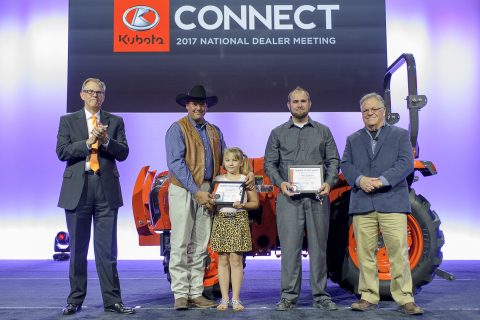 PHOENIX--(BUSINESS WIRE)--From the main stage of its annual dealer meeting, Kubota Tractor Corporation today announced four new farmer veteran tractor recipients in its 2017 “Geared to Give” program in partnership with the Farmer Veteran Coalition (FVC). 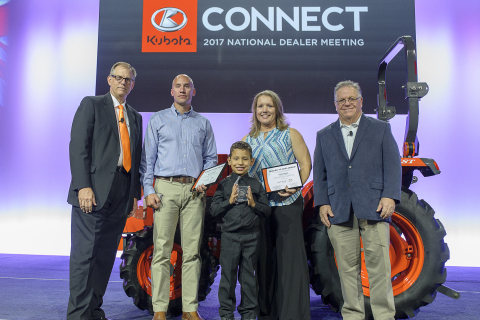 During a special ceremony, four recipients, one from each of Kubota’s four operating divisions, were presented with keys to new Kubota L-Series compact tractors in recognition of their years of U.S. military service and for their continued dedication to the country by pursuing futures in food and farming. Southeast Division: Matt (Charles) Fitzwater, U.S. Army veteran served through three deployments and is the owner of Rainbow Harvest Farm, a 10-acre pick-your-own and direct to consumer berry operation in Kentucky. “When we first started the farm, I didn’t think we’d need a tractor. But now I’ve realized how much our efficiency can be increased even with a small tractor,” said Fitzwater. “It’s hard to say how much this means to me – no more borrowing tractors for us! I can’t say thank you enough!” Fitzwater will be supported by Kubota dealer Lawson Tractor & Implement II, Stanford, Ky.
Northern Division: Randy Ramberger, U.S. Army veteran and owner of 5 acres in Indiana called Ramberger Family Farms. In his application, Ramberger shared his thoughts on perseverance: “There will be times you will want to walk away from a challenge, but in the food and farming industry you have people and animals relying on you to not quit… When you realize it’s not just about you that is when you take that motivation and push forward.” When told the news about being awarded a new tractor, Ramberger was overcome simply stating: “Thank you for the opportunity, you don’t know what it means to me.” Ramberger will be supported by Kubota dealer Dirt-N-Turf Sales and Rental, Greentown, Ind. Central Division: Joel Heinzeroth, recent retiree and 20-year U.S. Army veteran, is owner of 440 acres that make up Heinzeroth Cattle Company. Heinzeroth grew up on a farm in Iowa with his parents Ervin and Carol, and appreciates that his eight-year-old daughter and seven-month-old son can have the same experience. “I work in agriculture because I love it, and this donation allows me to really get back to my roots. I’ve had a tough army career including my time in Iraq. I’ve recently retired from military service and I couldn’t have done it without the help of FVC. I’m always here to help my fellow veterans in any way. My father died in a farming accident so I had to start my farm in Oklahoma from scratch. I’m glad to be involved with FVC, a program which promotes such a great vision.” Heinzeroth will be supported by Lindley Farm Equipment, Cordell, Okla.
Western Division: Cherri Marin, 21-year U.S. Air Force veteran, is owner of Sunshine and Reins farm in Oregon. Marin is the program’s first Air Force veteran. She was selected because she still has a desire to serve, this time helping her community and other veterans by becoming a mentor for work in agriculture. When Marin received the news about being awarded a new tractor she exclaimed: “I dream to grow and give back, and this donation is incredibly helpful for me to do that. I’ve had to beg and barter to use other tractors and it will be nice to not have to do that.” In her application, she stated: “I feel like I am at the time in my life to live out my passion and become self-sustaining while providing others with great products and service.” Marin will supported by Kubota dealer Linn Benton Tractor Company, Tangent, Ore.
Kubota’s philanthropic mission is to “power and empower those who move the earth,” and in that spirit “Geared to Give” was born in partnership with FVC in 2015. The program works to identify the needs and further the agriculture careers of those who have served their country and are now serving their communities through farming. In addition to the tractors, Land Pride donated implements to outfit each veteran with the right tools for their respective farming operations. Firebird Products, a Kubota supplier for aftermarket accessories, donated Kubota-orange canopies for each tractor, which will help shield the operators from the elements. Kubota Tractor Corporation, Grapevine, Texas, is the U.S. marketer and distributor of Kubota-engineered and manufactured machinery and equipment, including a complete line of tractors of up to 170 Gross hp, performance-matched implements, compact and utility-class construction equipment, consumer lawn and garden equipment, hay tools and spreaders, commercial turf products and utility vehicles. 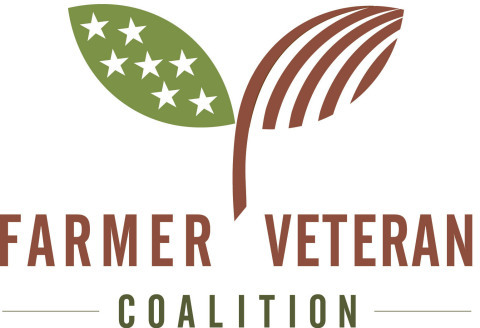 Kubota’s “Geared to Give” program is in partnership with the Farmer Veteran Coalition to provide financial support and donated Kubota equipment to U.S. military veterans pursuing a future in farming. For more information, visit KubotaUSA.com.